Neff, T. & Citrin, J. (2005). You’re In Charge—Now What?. New York: Random House. Conger, J. (2008). The Necessary Art of Persuasion. Boston: Harvard Business School Publishing. Pink, D. (2011). Drive: The Surprising Truth About What Motivates Us. New York: Riverhead Books, Penguin. Grant, A. (2013). Give and Take: Why Helping Others Drives Our Success. New York: Viking. Cialdini, R. (2006). Influence: The Psychology of Persuasion. USA: Harper Business. Lombardo, M. (2014). FYI: For Your Improvement. Korn-Ferry. Think about the leaders you have worked with, most admire and find most effective. What, specifically, did they do well? How did they develop you to give your best work and reach your fullest potential? What skills or attributes did they need to have in order to do those things well? How can you begin to build strength in those areas? TIP: Start practicing leadership skills (such as those in the graphic above) even before you are in a formal leadership role. Think about how you communicate with peers and superiors. TIP: Read “What Great Managers Do” for more ideas. How will you remain focused on listening to your employees as you gather information, rather than talking only about your point of view? How will you set the stage for getting honest feedback from your employees, both in the beginning and later as you all become more familiar with one another? TIP: The STICC method of communicating expectations and staying calibrated can keep you connected to your team. 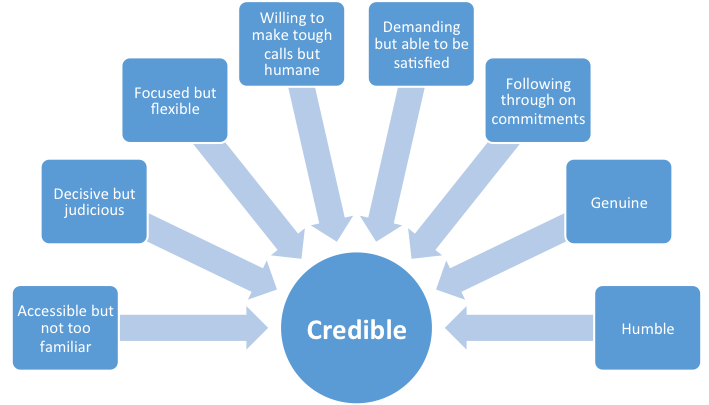 With whom can you build trust to hold you accountable for aligning your words and actions and to give you feedback on the consistency of your leadership behaviors? If you find it difficult to admit mistakes, how can you learn to communicate your sense of personal responsibility for missteps, and/or shared responsibility with members of your team? How can you share relevant personal information with your team, to build and maintain rapport? What are your standards for work quality? How do you communicate those standards to others? How and how often will you check in with your team to offer feedback and respond to their ideas/questions? How will you communicate that you are satisfied with your team’s work? How will you recognize employees for outstanding performance? What is your plan for engaging with your employees outside of work, including happy hours? What do you want your employees to know about your personal life, so they can relate to you as a person, not just as a boss? What do you need to know about their personal lives, to help you understand them and their motivations better? If you prefer to work alone, what relationships and coalitions can you build and actively maintain to help call you out if you withdraw from group discussion/communication? What accountability will you put in place to ensure you are staying connected? If you are a slow or conservative decision maker, how will you determine how much information is “enough” so that you make decisions in a timely manner? If you are a perfectionist, how can you learn to tolerate incomplete data? If you tend to make decisions fast and/or independently, what will you do to slow down and include your team in the process, and ensure you have considered all available, relevant information? How and when will you communicate about decisions to your team, and to other stakeholders? How will you set clear goals for your team, and for individual employees? How will you include them in the process of setting, communicating and following up on those goals? How will you adjust your original goals and objectives over time as you and your team make progress and learn more information? How will you remain focused on end results, and give your team flexibility in how they achieve them? How will you ensure that you give your employees clear, timely feedback (both positive and negative) about their performance? How will you represent and stand up for your team with senior managers? What types of situations might you encounter that call for more independent decision-making rather than decision by consensus? How will you communicate those decisions with your team? If you are a more direct communicator, what can you do to practice delivering tough messages with more care and tact? If you are a more compassionate communicator, what can you do to practice delivering tough messages with more directness and clarity? How will you keep track of commitments you make, and/or projects/goals/tasks you ask of your team? How will you hold yourself accountable to following through on those commitments and checking in on team members’ deliverables? Some questions adapted from tips in Lombardo, M. (2014), FYI: For Your Improvement. Korn-Ferry.